I guess you could say this is to celebrate our trip to LA where we are going to screen Marvel’s CAPTAIN AMERICA: THE WINTER SOLDIER, among many other awesome things like the MUPPETS red carpet premiere. So we are giving away a Hasbro Marvel Super Hero Mashers Battle Upgrade Action Figure assortment… oh my, say that in one breath! Anyways, good luck everyone! As we all know, a hero always lends a hand. Or a leg. Or a head! Hasbro’s all-new MARVEL SUPER HERO MASHERS action figure line features your favorite MARVEL Super Heroes and Villains with completely interchangeable parts and accessories, so kids can create their very own ridiculously silly heroes! With more than 20 unique MARVEL SUPER HERO MASHERS characters planned for 2014, there are tons of silly ways to mash them all. 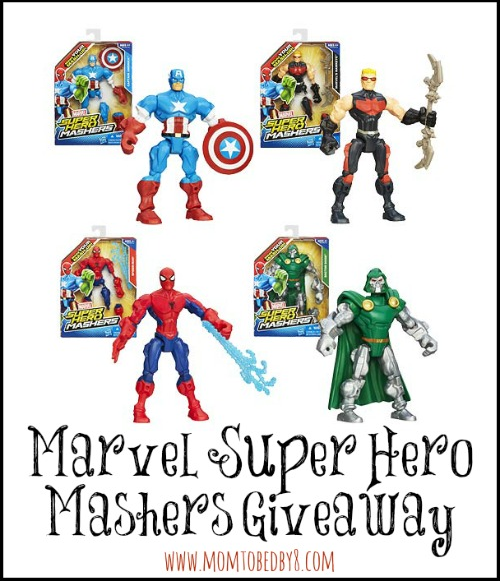 Prize: Hasbro Marvel Super Hero Mashers Battle Upgrade Action Figure Assortment. Organized by: Mom to Bed by 8. Giveaway ends March 11th at 11:59pm, open to US residents, ages 18+. To enter please use the Rafflecopter form below. Good luck. These are SO AWESOME! My nephew would LOVE these! I love the Wolverine action figure. I like the Thor figure best. My grandson would be happy with any of them.